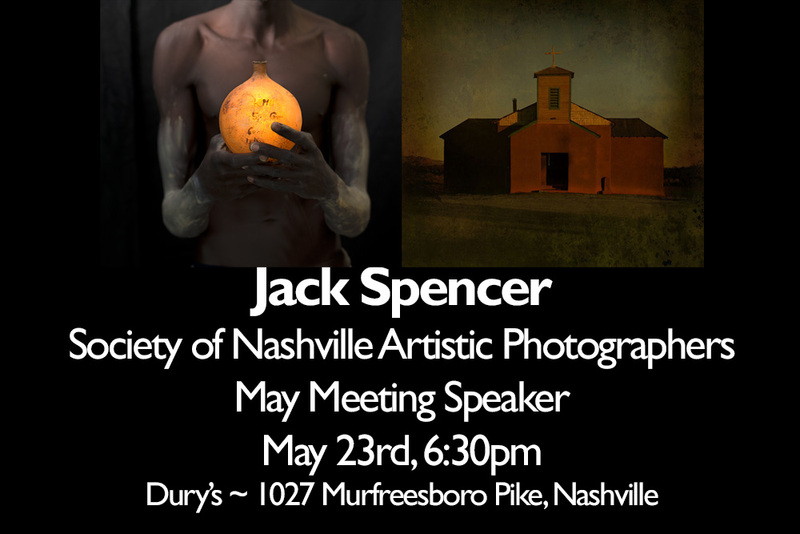 Jack doesn’t make many appearances like this, so our meeting will be a great opportunity to hear about and see his work and to meet him in person. A thousand, thousand thank you’s to David Morel for bringing Jack to our group. And…great photography continues with the opening of S.N.A.P. member, professional photographer and artist, Jerry Atnip’s exhibition “Gone South” at the Parthenon Gallery. Gone South will be featured at the Parthenon, 2500 West End Avenue, from May 6 to August 27, with an opening reception on May 12, 6 – 8pm. An artist’s talk and reception, led by Nashville Arts’ Paul Polycarpou, will be held on June 1. New artist!! Chris Parsons of Tin Crown Photo, native of South Carolina, now lives in Nashville. His rekindled interest in 19th century photography dates back to his childhood days collecting old tintypes on antique outings with his mom. Working with the wet plate collodion process, Chris aims to capture the symmetry and simplicity of human subjects & the natural world using a medium embracing the beauty of imperfection. Next Thursday is the opening reception for the new exhibit at Chromatics’ 2nd Floor gallery. There are a lot of SNAP members represented, so check it out, May 18th from 6:00 – 8oopm. Byron Jorjorian, our recent speaker sent me this announcement to pass on to you. I have participated in one of his workshops, and I can tell you it is a wonderful experience and well worth the investment. Join Byron and Ron Rice as they lead your exploration in the striking landscape of Little River Canyon National Preserve. Located near Fort Payne Alabama at the southern edge of the Cumberland Plateau. No strenuous hiking required to participate. We are excited to announce that Ron Rice will be joining us for this and many future workshops. This will enable us to make sure that everyone has easy access to instruction while we are in the field.During the workshop, we will have a critique session and then apply what we have learned to go back out and shoot as we continue to explore this beautiful national preserve. Our S.N.A.P. meeting last month featured the juror for our Provence exhibit “Night”. Heather Lose is a creative director and fine art photographer who helped co-found the Nashville Community Darkroom. She discussed her selections for the exhibit and explained her process as juror. Again, our thanks and appreciation to Emily and Wesley for their work on our exhibit.